Replica of Jowo Rinpoche. Two of the statues at FPMT International Office’s Jokhang, Portland, Oregon, USA. Please enjoy this sampling of inspiring FPMT holy object activity now spanning the globe! For more information about any of these holy object initiatives, please visit the FPMT directory at the back of this magazine for contact details. FPMT International Office currently manages five projects dedicated to producing holy objects for the benefit of the wider FPMT community: a project to build a 14-foot (four-meter) high Nagarjuna statue to support the long, healthy life of Lama Zopa Rinpoche; the Padmasambhava Project for Peace; the Stupa Fund (see Mandala July-September 2009); a project to support the writing out of the Prajñaparamita and Sanghata Sutra, and the Prayer Wheel Fund. 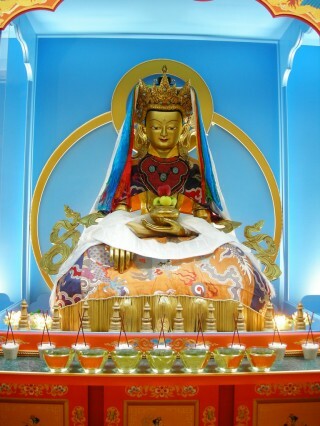 By collecting and managing funds, Lama Zopa Rinpoche’s office is able to support a variety of holy object projects – most of them inspired by Rinpoche’s vast visions for FPMT’s future (fpmt.org/projects).